So first thing today I stripped off the upside down quilt (which actually is a beautiful pieced Buggy Barn cat quilt), reorganised things, and now it's much better! Today is the last day of school holidays for my kids, so the rest of the morning was spent tidying, vacuuming and general organising getting ready for my return to work. I did however to squeeze in a little bit of sewing time. Block One of the sort of new project was completed! Isn't it lovely? The colours were pulled from this feature fabric (although I had long since integrated these fat quarters into the stash pile). 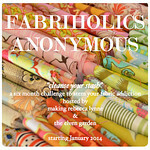 Included a luscious bundle of co-ordinating fabrics that were a lucky win early last year. Using this lovely wall hanging as inspiration... I stopped trying to work out how to include the feature fabric within the blocks (sometimes it is hard to use these super large scale prints effectively) - instead using it as the border only. Choosing this quilt block creates the perfect vehicle to highlight all those lovely fabrics. I altered the block size, block centre and scattered the fabrics throughout the triangles (instead of keeping the triangles for each block the same). Did I mention that I really like how this is turning out? Just a bit of a change on the design wall today. I've had the Modern Sampler up for what seems like months now... it was so refreshing to take it down and lay it out on the floor instead. This photo shows how I tend to put quilts together, first in units of four, then 16 patch units. Only a few more seams then it will be done. It didn't take long for other things to crop up though. Nadia has claimed a small section for her own blocks. After choosing her first fat quarter pack (what a mother/daughter moment) she announced that she wanted to make a quilt! These wonky cross blocks are perfect because she can practice her straight seams, but as it needs to be squared up anyway, it doesn't really matter too much what her seam allowance is. I popped up the four My Tweets blocks that need blanket stitch - just in case I'm inclined to forget about them. I've started piecing the second block but still have a few spaces to fill. Because I've been so good... I thought I deserved a crack at something new. Just one block. Until I finish something else momentous...like quilting or binding or something, and then I will be "allowed" to do another block. Well, this feature fabric has sat in my stash for at least a couple of years - so not really new. And I had it on my list of WIP fabric piles needing a project. I've come up with all sorts of projects ideas over the last couple of years - but nothing that has said "do it!" After trawling through the book 100 Fabulous rotary cut quilts... I finally found that one that I just had to start. This is only a small portion of the first block... but I am loving it! ... it was much more straightforward. There was only one piece that measured odd at 2 5/8ths. Easy peasy. ... onto fabric. Confession time... I had to buy some batting, so I bought some binding fabric. This is for the Tokyo Subway and I think it'll look perfect, and I'm sure it fits into the necessary purchases department. While it is pretty, it is a struggle to describe the purchase as exciting though. Isn't it yummy? This is a Parfait set... and much more exciting... looks like you could eat it. Thanks Monika. It might just turn into something that looks a little bit like this... if I am ever allowed to start a new applique project. I think I bought this pattern about this time last year. And the blocks so far. Two blocks need machine blanket stitch. For a bit of variety, and sticking to projects that are on my WIP list, I've added a few more scrap tiny square blocks to my Seeing Squares pile. This is one of the larger units that combines the smaller units into a 12" block - just to get some idea of how it is starting to look together. Haven't decided yet whether to swap out some of the coloured squares (leftovers from the Tokyo Subway) for neutral solids to give it a bit more airy feel. Sometimes when you make things you know exactly how you are going to quilt it, what batting to use, and what the binding is going to be. Other times you have a general idea... but need to work out the finer details. Every so often, you work on something that you have no idea what it's going to be, let alone what you are going to do with it. The Constellation quilt fits into the middle category. Right from the beginning I was pretty sure I wanted to do something straight-ish in the star blocks, that highlighted the dark ring formed by the half square triangles. I also wanted to do Angela Waters signature spiral in the background - but wasn't sure how I would manage the quilting since it was over such a large area, and I'd be doing it on my domestic machine. First up, I practiced the spiral quilting on the Giant Chevron quilt and was feeling more confident in my ability to fit it around shapes. I decided to add some curvy sections of pebbling - radiating out from the central star (sort of like a shooting star), and fit the spirals in between. Although when I started this, I still wasn't sure exactly what to do in the stars. Still in the early stages, but pleasing progress so far.